Also.... Notice anything different?? I have my OWN url! My history with blogging, or at least with fashion blogging was that I started on tumblr to hopefully build some kind of following as I've had success doing that in the past relating to my other blogs. I initially planned on jumping from tumblr to my own url, but my political blog was causing me issues and I didn't want "two babies." I find tumblr limiting with their photo sharing capabilities and found myself in a position where I needed to showcase multiple photos for other people in a better display, so I went with blogspot having had success here before and not generally "loving" Wordpress. Initially I thought I'd only be on blogspot for a month while I worked out my political blog's technical issues, and then I thought maybe wait till 2015 because why not just stay put, but then about 2 weeks ago a fire was lit from underneath me and I was ready to get the wheels moving with getting my own url! About a week ago I officially registered it and made necessary technical transfers, but then I decided to go awol for a hot minute! I was hoping to add a few new things while not "officially blogging" here but that was in vain-which I'm not totally surprised about. I guess this is a bit of a "Week Fashion" as I haven't touched Instagram since Wednesday, and I had to wear clothes most days, right? I'm sure I'll be sharing these pics on Instagram as daily outfit shares for days I'm at my computer in yoga pants all day, but for now I'll share a few of this week's outfits here (as this weekend had a lot of non-interesting fashion while running errands, researching, or working on my computer). I was actually out late earlier this week (a rarity for me! ), which is why this photo is somewhat poorly lit. Damn you, daylight savings time dwindling down! I have other cameras as I'm a former/sometimes still photog, but my only practical one to bring out and about with me is my point and shoot (not trucking a DSLR to a restaurant for a damn outfit photo just to keep the legitimacy of an outfits in real life fashion blog, ya know??) but the battery to my point and shoot is dead and I can't seem to find a battery charger that fits that battery. Ugh. Until now I've more or less just used my iPhone for outfit pics because for mostly outdoor pics iPhones are fine and low maintenance for any loved one snapping the pictures, so I'm really not digging this "lack of daylight" thing when night time activities are involved! But onto the fashion...I love this dress, it's the epitome of fall colors, it's feminine, and yet practical to wear out on a chilly October night! I've featured this bad boy before, but I had way more fun styling it this time because I feel the belt breaks it up a bit and I can't get enough of these matching white shoes! This was an out to dinner outfit, and luckily this time I squeezed in a snapshot before the sun went down! I got this Trashy Diva skirt on sale somewhat recently, after lusting after this pattern on basically all forms it came in for around a year! I feel like fall in Denver was made for the way I like to dress: it's not too hot nor is it too cold. Longer skirts totally work but I don't need to layer so much! I'm milking this look for all it's worth as long as this weather lasts!! Even though this print is tropical, I still say it's a good multi-season patten because of the merlot hues in it. 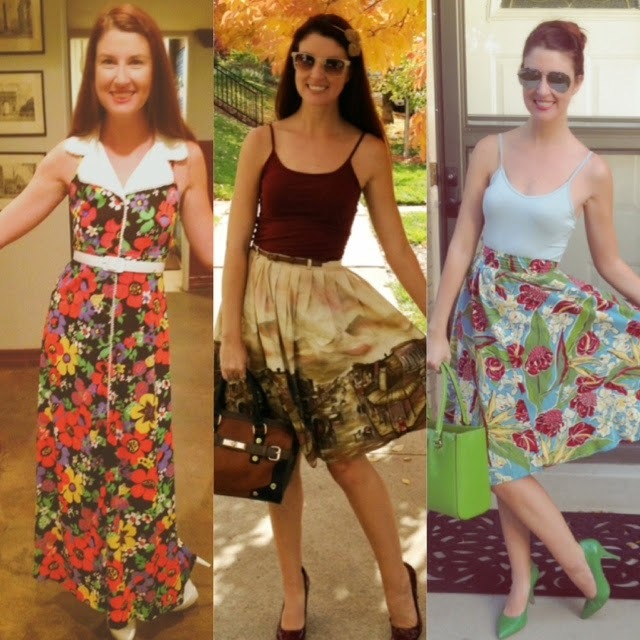 This ah-mayz-zing skirt I found recently on eBay and won it by bidding $22! $22!!! See below for the incredible detail of this and remember that $22 number again. Here wraps another Weekend Fashion, but this time on my new url! I'll be posting my usual scheduled posts this week, plus a new one, and I may squeeze in a few of the posts I didn't get to post last week as I more or less had them ready to go! Also check back frequently for new pages and other features as I play around more with owning my own site. Hope everyone had a great week/end and I'll be slowly catching up with your lives as the next few days progress. MWAH! These outfits are amazing! I'm kind of in awe of that first dress. The collar is really what draws me in (: And that skirt from eBay is such a good find! I love that print on it.